1–How is logic-in-use applied to educational research? Logic used by scientists through the process of inquiry. When an educational research wants to come up with an answer to an issue or problem, he or she must engage in logic in use. I think it is important to challenge our beliefs and our ideas to better reconstruct our logic. Logic-in-use applies to educational research by dealing with what educational researchers do as well as how they are doing as scientists. Logic-in-use in educational research, uses logic. Logic-in-use is applied to the field of education through the process of inquiry. Educators reconstruct logic by putting the hypothesis in use over time making it logic-in-use until this logic is no longer feasible. 1 – What do you mean by “uses logic”? 2 – What do you mean by “the process of inquiry”? 3- What do you mean by “the hypothesis”? Rather than answering these questions, pick one and expound upon it. In education it often seems that the newest hypothesis is put into place as the “latest and greatest” concept. Over the past years my district has focused on Explicit Direct Instruction, PLCs, and transitioning to the common core. It seems that often times one idea is put into place for one school year and the idea changes from year to year with no real connecting of the concepts. At the time of implementation, my district is very excited about the new concept and has the belief that this one strategy will improve student learning. However, after implementation for one year, opinions often change and the “new and improved” concept to improve student learning is put into place. I meant, “comment above.” Sorry. I think that it is great that your district does not “cave” or feel pressured to always try the latest and great new theory in education. How is this accomplished in your district? Is it through discussions at admin meetings? Or is this something that you have decided to implement at your school site that isn’t greatly pushed by the district? If logic-in use describes the cognitive style of specific researchers, I would have to say, the logic-in use for educational research is based on a generated hypothesis or guess about a specific problem which is formulated into a research question, it is then put through a series of inquiry based activities to ellicit results, which hopefully give some insight into the answers to the original research question or hypothesis. Education itself is full of acronymns and jargon that are very specific to the field, and an outsider would need to learn an abundance of concepts, terminologies, and processes in order to adequately analyze the environment effectively. Thus, those in the trenches of educational research have some background knowledge on the subject. Without some understanding of the workings and machinations of the education field I feel it would be difficult to use logic-in use effectively, and then to reconstruct the logic accurately. Fieldwork in education consists of observation and methodologies using inquiry tools to gather information. Rarely do we see an outsider infiltrate the system. If we do, they have an insider guiding the way for logic-in use to be applicable. Conversely, it is taboo to analyze a system with which one is entrenched in education. What seems strange about educational research is that many researchers have an insiders understanding of education, however, they are required to look at their research as if they were looking into a fishbowl and not a fish swimming in it. Sometimes this seems counterproductive to me, and quite honestly illogical. Great point Becky. “Fish are the last to discover water”. Clyde Kluckhorn said that many years ago to describe culture but the principle applies here. Can you study a thing you are so close to? If you are able to, that you must have very effective means of controlling for all your biases. Can we ever really control for all bias’ anyway? Can’t we authentically just be searching for the truth? I bring bias’s when I am looking into the fishbowl or when I am within the fishbowl. Couldn’t research be collaboratively tackled by two or more researchers with different roles in the research process (one on the inside and one on the outside)? This kind of cross collaboration could produce some interesting research I would think. Becky, Thank you for for such a well thought out response. I was actually becoming quite confused until I read your post and it all made much more sense to me. One comment I was thinking as I read…I was involved in a project with Region 8 (Ventura, Santa Barbara, San Luis Obispo and Kern County’s) for After School Programs and the person who came to interview and tape me was not from the field of education. To me that was a challange because I really had to explain every concept I was referring to in great detail to help build background knowlede and understanding for her. I truly believe it helped me to articulate my thinking, but it also helped that she was smart, and knew what questions to ask to elicit responses to help her understand. If the interview had been conducted by someone from the field of education there may have been several assumptions made about our level of understanding that may or may not have been accurate. The same thing is occurring now as I work with a new consultant from the California Department of Ed.-here background is not in education but it is in research and I feel that because she is not an educator our dialogue is much richer because everything has to be explained in detail. This same concept would apply to researchers and their position in relation to their field of study. That being said I am very close to the field of After School Programs and yet I am about 90% sure that I will be doing my disseration on that topic becaiuse it is what I am immersed in every day. However perhaps the ease with which you control your biases is dependent upon the focus of your research question and your position in relation to the field?? What an interesting take on it, Becky. And one I haven’t really considered because this is something we do everyday. Definitely food for thought. 1–How is logic-in-use applied to educational research? As I understand it, logic-in-use is a hypothesis that is put to use over time until it is not needed or proven to be inaccurate. All of us who are working on our dissertations or working on a study begin with an educated guess of what we think is the issue or problem. We move forward based on this or these hypotheses. 2–How is logic-in-use applied to the field of education? Logic-in-use as it applies to the field of education would be the same as with educational research. We base our implementation, policies, or procedures off of a working hypothesis that we have either generated ourselves or have learned from others. An example of this might be faculty mentoring. Research has shown that faculty mentoring is an effective tool in student attrition. However, before the studies began, somebody had to ask the question: Does faculty mentoring have an impact on university retention rates? The logic-in-use might be: Faculty mentioning does have a significant impact on university retention rates. 3–How do educators reconstruct logic? Educators reconstruct logic when they either confirm that the logic-in-use was correct or incorrect. In the above mentioned example, researchers confirmed that faculty mentoring has a significant impact on university retention rates. Thanks, Jeremy. How does faculty mentoring work at CSUB? Are new faculty members assigned a mentor? How do mentors get chosen? Educators reconstruct logic similar to all scientists. A scientist would reconstruct logic based on observations and experimentation but also from the hypothesis and findings of others in the field. Just like a scientist would seek the answer to the question of “what is dark matter?” an educator might seek answers to behaviors in a classroom but instead of asking what and educator might formulate questions and hypothesis in an attempt to answer question relating to why students behave a certain way. Unlike the scientist in the lab an educator would take a more ethnographic approach and use observations, interviews, and case studies to reconstruct logic and formulate a hypothesis and attempt to see if the hypothesis is correct. A response to most of these questions really seems to come down to the fact that education and the field of education can only be understood through logical trial and error. In a sense, we are limited by what we understand about some concepts and must, instead, as the summary states use observation, educated guesses, and scientific intuition to come to a set of hypotheses regarding the inquiry. Instead of lab tests and trials in order to determine a firm definition or answer, field research, for instance, is used in order to find logical and easily replicated theories that help use to survive and better ourselves in a given setting. It is amazing that we, as creatures drawn to pattern and familiarity, ARE able to train ourselves to observe settings and alter behaviors for positive or negative actions and reactions. Wow…trying to get my head around this. So, logic-in-use in education can be compared to chess? Okay, that helps. As a chess player, maybe it means that I know how to play chess, which means I probably always have a set of “first few moves” that I always use. Then as the game continues, I use my favorite pieces and strategies to meet certain outcomes that I feel should be met in order to cause me to be victorious. Now, in the classroom…the same applies (doesn’t it?). I walk into class on the first day of school. I have brought my assumptions with me. I have activities planned for the first few weeks to sort of “kick things off.” Then I begin pretesting and trying to figure out abilities, attitudes, etc. Then, based on the students’ responses (chess moves) I make my own move based on what I think is important to reach my ultimate objective (student learning and social maturity). Teaching is definitely like playing a game of chess. There is no “magic” script that can be provided for every classroom that allows for all students to succeed. It is the intuition and informal assessment side of teaching that I find that new teachers sometimes have difficulty with. In credentialing classes we are taught one way (maybe two) to teach a particular lesson. Once we graduate from college and become teachers in the “real world” there is no exact plan to follow. Those teachers that are successful are those that are able to adapt to the needs of the students and let their students guide their lesson delivery module and instruction. When I think of logic-in-use as it is applied to the field of education, my mind immediately thinks of the No Child Left Behind, and Race to the Top criteria placed upon the professionals in the eudcational field and the tests foisted upon American students. The logic-in -use for such tests holds that if we teach students the expected standards all students should learn, then they will show a level of proficiency on this test that is needed to have mastered the information. This in turn, will shrink the achievement gap between the haves and the have nots, and by 2014 all students wil be proficient and an American education will be proven successful. Obviously, the logic-in-use has not been proven to be as successful as was hypothesized, and quite honestly, NCLB was enacted with many hidden agendas in mind and for a variety of political reasons not merely as a scientific inquiry. If NCLB would have been tested using scientific inquiry and the logic-in-use that promotes such research, NCLB, most likely would not have been shown to be the best path to follow to insure all students academic success (reconstructed logic). Using logic-in-use we must ask ourselves such questions as why use a written test to prove academic success, what does academic success mean and why does it matter, are the standards we have chosen the best we can offer students, do tests promote life long learning, is life long learning more important than achieving academic success, and others? As I read through the posts, Troy’s seemed to help me put my mind around the logic-in-use question. I think that a good educator does a logic-in-use model every time s/he begins the day. As I present a lesson, I need to test out what it is that the students know and what I need to build upon. The assumptions that I bring in when I meet the class for the first time or for the twentieth time will play a factor in what I expect from the students and, in some cases, what I get. Becky’s post about NCLB also hit an “aw ha” moment for me. I think that if the “leaders” had to use a scientific approach to make decisions about how we are going to make sure that all students have an equal opportunity to education, that we as educators would not have to keep trying to fill in the gaps and try to prepare our students for a test that may or may not be taken on the best day for them. Although I think that the Common Core is a step toward the right direction, the methodology of deciding if an individual student learned everything s/he needed to still panics me. As I read the discussion notes and comments I find logic-in-use to be a skill many solid educators would use in every day life. Whether it be in the classroom, as an administrator making budgetary decisions, or conducting educational research the process of inquiry is vital for success. Conducting relevant research in the area of your research topic is a process of inquiry, in and of itself. Developing the appropriate design process is part of the inquiry process. Furthermore, conducting the research and analyzing the findings is again all part of this process of logic in use. As educators and researchers we have to construct and reconstruct the field and environment in which we interact and study. As Troy states, the chess model makes sense. But, I would think every chess move you make could bring about positive alternatives to your study, but also a host of threats to the study design. “Our viewpoints are not wrong. What is wrong is only what our viewpoints deny not what they affirm”. I keep rereading these two sentences and would like anyone to comment on that specifically. Then after reading Becky’s fishbowl comment, which I like, I only have more questions! Becky, you talked about an insider and an outsider working together. Jeremy and I were talking about this tonight. It seems like using something we are familiar with would be most beneficial for our own research, but we then have to worry about bias affecting our interpretations. Would using another similar setting(s) help with this problem? I have been considering student engagement in regard to EL student growth. Would using data from different districts help complete the picture and minimize preconceived ideas? I know understand why some type of research is important to complete before completing a literature review. Logic-in-use is the thinking process by which researchers approach any inquiry. In terms of educational research, unlike other disciplines, many biases, prejudices, and beliefs have been internalized because everyone has gone through an educational system. We all went to school as children so every educational research has been influenced by their educational experiences. 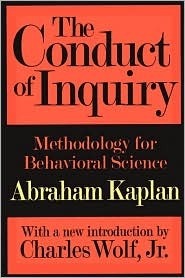 Furthermore, as Kaplan states, “not only language and culture affect the logic-in-use, but also the state of knowledge, the stage of inquiry, and the special conditions of the particular problem.” I believe the awareness of our logic-in-use must be attained in order to begin developing a reconstructed logic. Consequently, in the field of education, many of our research questions or problems that we have identified are identified based on our logic-in-use. For example, the Professional Learning Community concept has challenged the belief that poor student performance is a student problem. Now, we are asking different questions. Did we teach it? Is it a teacher problem? Through inquiry, data collection and analysis we can develop a reconstructed logic. I agree, Hana. We have to start looking at things differently to reconstruct our logic, however, our experiences, knowledge, etc. does play into our logic-in-use. As long as we are aware of our biases, I think the reconstruction can begin. I agree with Hana that “logic-in-use must be attained in order to begin developing reconstructed logic.” As many colleagues have pointed out, educators implement logic-in-use daily. The danger, I believe, is using the same logic, same patterns, same techniques repeatedly although the “chess game” has changed and there is a new chess player across the table. Sometimes, instead of reconstructing logic, educators continue to exercise the same logic-in-use in hopes that the same patterns will return and the same techniques will be successful. (Some educators try to teach the same way they did 30 years ago or teach the same way they were taught when they were in elementary or high school). True Professional Learning Communities engage in constant inquiry and attempt to reconstruct logic through observation of student behavior, collection of student data, and most importantly, the discussion and analysis of the outcomes and subsequent planning how the team will change their strategies and begin the cycle of observation again.